Spanish missions, which stretch from San Francisco Solano in the Bay Area to San José del Cabo in Baja California, are a visible reminder of the Spanish colonial history that California and Mexico share. Mexican law designates these missions an integral part of that nation’s heritage. 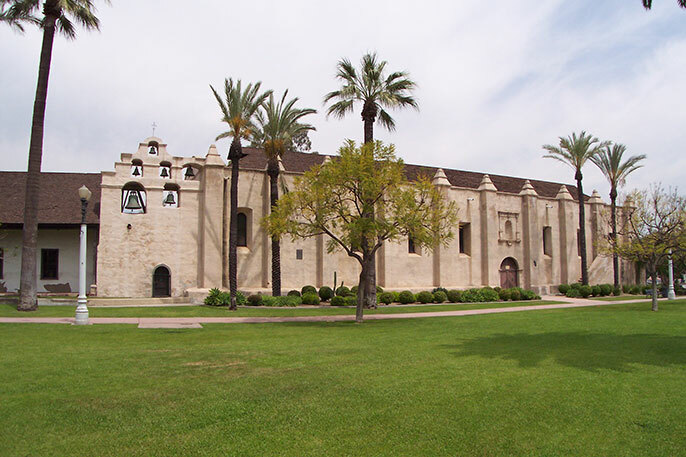 Not so in California, where the preservation of Spanish missions and their archives and artifacts is largely left to private donors and organizations. The UC-Mexico Initiative’s Arts and Cultures Working Group is convening University of California scholars, Native Americans, and preservation experts and government officials from California and Mexico to examine the shared heritage of the missions and how to preserve their historical and cultural significance. The inaugural meeting will be held June 2-4 and will include a visit to San Gabriel Mission. Among the attendees will be Ambassador José Luis Martínez y Hernández, director general of international affairs of Mexico’s Ministry of Culture. The UC-Mexico Initiative’s Arts and Cultures Working Group is providing $25,000 to fund the binational summit. The project, titled “Shared Pasts/Shared Futures: The Missions of California and Mexico,” will consider the complex histories and common heritage of the missions and new ways of preserving and presenting them to the public in California and Mexico. The UC-Mexico Initiative aims to redefine bilateral collaboration through the following approaches: technology and innovations to provide stimuli to fuel economic growth in California and Mexico; binational academic exchange and collaborations to create an intellectual powerhouse and educate and prepare the workforce of tomorrow; and engagement to solve shared and complex social, political, environmental and economic problems. Overall, the strategic direction of the UC-Mexico Initiative is to foster large-scale, high-impact research activities, to increase the breadth and depth of collaborate research engagement, and to increase the number of UC academics who are engaged in scholarly pursuits with Mexico. In Mexico, responsibility for preserving and protecting the colonial missions of New Spain falls under the jurisdiction of the Institute Nacional de Antropología e Historia (INAH). INAH is spearheading an initiative to designate the Camino Real Misionero de las Californias – the road connecting the Spanish missions of the Californias– a UNESCO World Heritage site. Scheduled to participate in the binational summit are: Hughes; Ambassador Martínez; Steven Hackel, UC Riverside professor of history Junípero Serra biographer; Ohlone tribal members Vincent Medina and Andy Galvan, who are also curators at Mission Dolores, San Francisco; Julianne Polanco of the California Office of Historic Preservation; Francisco Javier López, INAH director of world heritage; Julia Bendimez Patterson of INAH Baja California; Bárbara Meyer of INAH Baja California Sur; Tsim Schneider, a UC Santa Cruz archaeologist and citizen of the Federated Indians of Graton Rancheria; Angela Mooney D’Arcy of the Sacred Places Institute for Indigenous Peoples, Juaneno Band of Mission Indians; Auxiliary Bishop William Clark of the Roman Catholic Diocese of Los Angeles; Marco Antonio Samaniego López of the Instituto de Investigaciones Sociales de la Universidad Autónoma de Baja California; Holly Moore, the Lloyd E. Cotsen Head of Conservation at The Huntington; Laura Stalker, associate director of library operations at The Huntington; Andrés Triana Moreno of INAH Escuela de Conservación, Restauración, y Museografía; Manuel Ramos Medina of Centro de Estudios de Historia de México; Exequiel Ezcurra of UC MEXUS; and Pedro Arath Ochoa Palacio of Centro Cultural Tijuana.